I thought it was time I started a build topic for my Panzer III. I will be copying some of the good modifications that Stephen, Jeff, Derek, Clive and others have done, but I do hope to have some of my own. I've already drilled new holes in the side plates to reposition the rollers, etc., I'll show some photo's when I mount the rollers. Then I started on the suspension arms to change the profile from rectangular to circular. 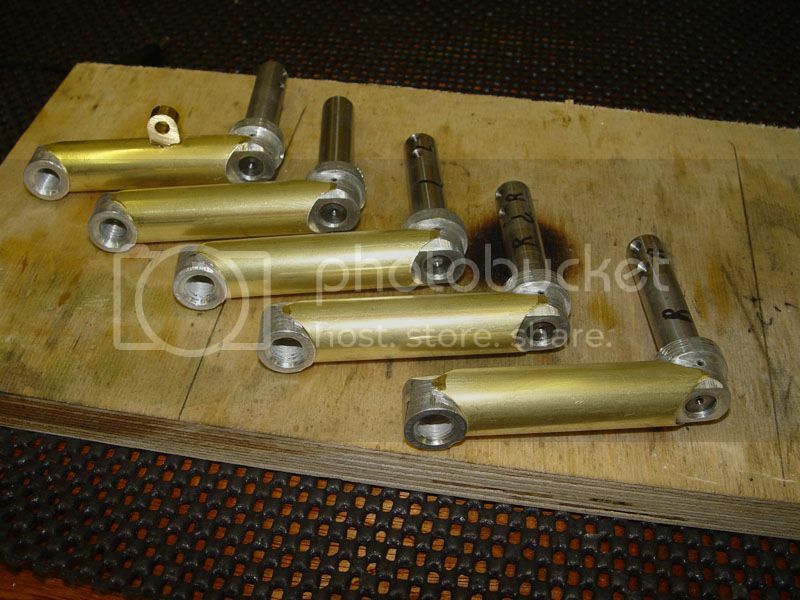 I had a play at adding half round section aluminium to the suspension arms, but settled on using brass tubing instead. The brass tubing ends were shaped to match the diameters of the suspension arm ends and then the tubing was split at the rear. 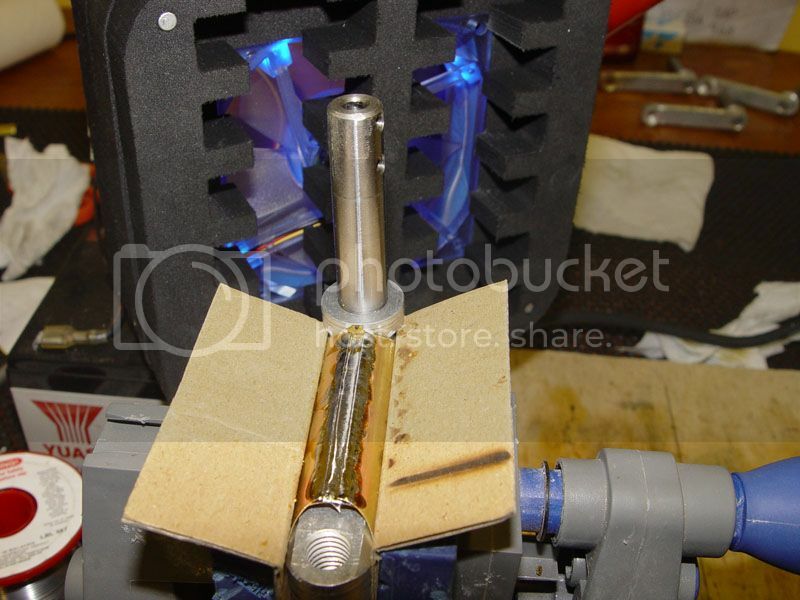 After making a brass tongue to fit inside the split tube, it was soldered to the split tube. As well as using Loctite 2701 on the suspension shaft/suspension arm threads the suspension shafts have been pinned to the suspension arms with 2mm roll pins. 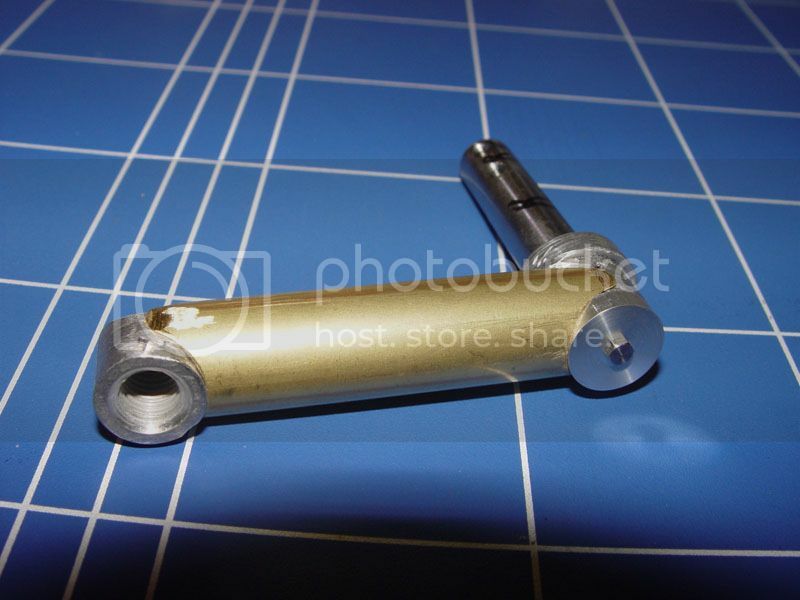 I've also drilled and tapped the suspension shaft to accept a 7BA bolt. I'm going to make little caps to raise the height at that point to be level with the brass tubing. Then I need to make the disc's at the rear of that section, like Stephen has done. Then finally adding filler to finish the profile off. Last edited by Sarah Frazer on Fri Oct 23, 2015 11:42 pm, edited 4 times in total. A question; I am not a PIII owner but was wondering "what are the arms made of , Aluminum? I am suprised that no one has tried offering corrected "arms" for sale. Very nice work Sarha, That looks really neat, looking forward to more pics. Hi Sarah your arms look great , What size brass tube did you use. Excellent work, the brass tube looks perfect - very clean modification. Brian, the suspension arms are made of aluminium, there would be quite a bit of work to offer them as an after-market part. Jeff, I didn't use any inserts, but I did chamfer the corners of the rectangular section like you did. It fits quite snug on the top and bottom surfaces, but I was wondering about filling the voids in the sides with epoxy, do you think it is worth it? Dave, the tubes are made out of 21/32" tubing (wall thickness 0.014"), which equates to 16.669mm outside diameter and 15.96mm inside diameter. In the Panzer Tract Panzer III book the suspension arms are 10mm at 1/10th scale, so 100mm divided by 6 equates to 16.667mm outside diameter. If you use the same method it's better to use a cutting disc than tin snips as it gives a flatter finish to solder to. I used a 3" cutting disc, which actually gives plenty of room to solder. Also the brass tubing will spring out slightly when cut, so it will need to be clamped together when soldered. Solder in stages so that the Loctited threaded section does not get too hot. The photo above has the disc and 7BA bolt added, it still needs the rear discs and then a bit of filler. Last edited by Sarah Frazer on Fri Oct 23, 2015 11:49 pm, edited 2 times in total. Thanks for sharing this technique with us! Excellent! Another great Panzer III build under way. Look forward to seeing more as you progress. Last edited by Tim Bowman on Sat Jan 30, 2010 2:15 am, edited 1 time in total. Thanks for giving me some new ideas on finishing the suspension arms! I was sitting around trying to figure out if I had the artistic talent/patience to sculpt all those bosses on the ends. Can you tell us how you built up the boss under the disc and bolt. Is it a circular aluminum wafer under there? 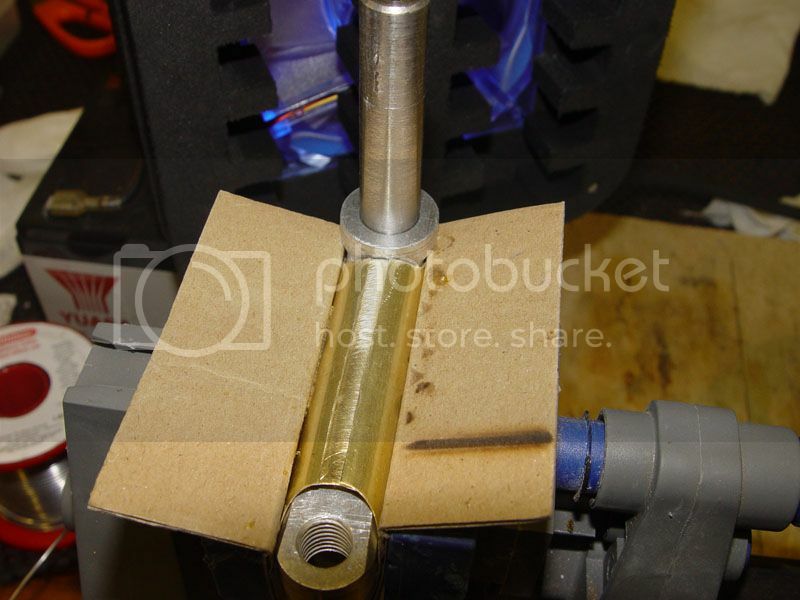 The first photo is the brass tube before soldering. Initially the outer tube ends butted together, but I wasn't sure how the solder was flowing around the joint. So I made the cut out wider, which made it easier to solder. Instead of doing two thin cuts with a Dremel cut-off wheel, I used a three inch grinder which gave me a wider slot. The second photo is after soldering the joint. I soldered the joint in three sections and then used the fan behind to cool the suspension shaft so that the thread would not get too hot and degrade the applied Loctite. Afterwards I filed the excess solder off the outer tube and later I'll use a little filler to fill the seam. Are you going to keep your Panzer III now Dale? Last edited by Sarah Frazer on Fri Oct 23, 2015 11:54 pm, edited 5 times in total. The disc is used to build up the boss. It is made of aluminium, 4mm thick, 16mm O/D and 2.5mm I/D so the 7BA bolt can pass through. I did think of cutting the discs out of plastic card, but eventually turned them on a lathe. I intend to put some filler on the boss to make it cone shaped like the full size suspension arm. OK thanks Sarah ---got it!